Chopper4 in Washington, D.C., captured footage of this circular rainbow over the city. 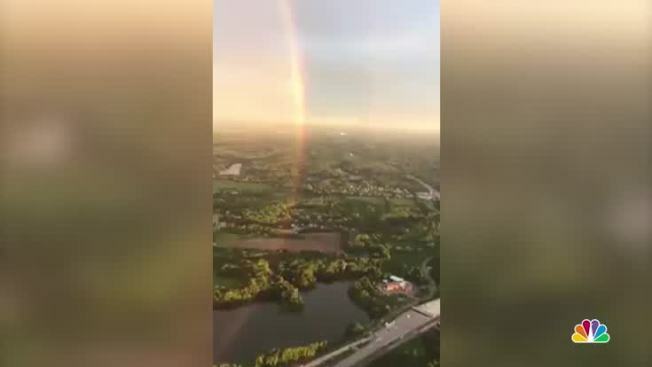 NBC Washington's Chopper4 captured footage of this circular rainbow on Friday. Generally we see an arc, not a circle. What's different about this rainbow? To start, Meteorologist Bob Henson of Weather Underground explains why we see rainbows in the first place. "The most common rainbows form when you look at a rainshower or thunderstorm when the sun is at your back. The light refracts from the back of the raindrops and hits your eyes at various wavelengths, thus producing the colors we see. The geometry is very particular: if you draw a line from the sun through your head, it will go to the middle of the circle made by the rainbow arc, and the arc is always 42 degrees away from that line." So, he says, if you’re facing away from the sun and look from that point, the raindrops in an arc along that angle will bend the light back toward you, and you'll see a rainbow. "The reason is the planet you're standing on: The Earth gets in the way —seriously. When you see a rainbow, the center is in the exact opposite direction of the sun, and the bow is a circle 42 degrees from that point (where there are 360 degrees in a circle). So if the Sun is rising exactly in the east, the center of the rainbow is on the horizon due west, and the top of the bow is 42 degrees up (almost halfway to the zenith). It's caused by raindrops in the air, and it doesn't really matter how far they are from you. But in general when you look above the horizon you're seeing a long long way, so you see lots of drops, but as soon as you look at the ground closer to you, there's less space for raindrops. Fewer drops = fainter rainbow (also, the ground is usually dark, making it harder to see the rainbow against it). "So if you are in a plane, or on a hill, you might actually see more of the rainbow because there are still raindrops below you."